The owners of an Art Deco cinema destroyed by fire three years ago say the building has not been sold and they still plan to rebuild it. 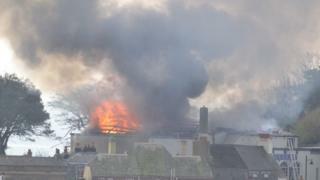 The Grade II-listed Regent Cinema in Lyme Regis, Dorset, was engulfed by flames in March 2016. WTW-Scott Cinemas said false rumours were spreading that it had sold the site following the merger of Regent owner Scott Cinemas with WTW in 2017. But it said the partnership had "helped solidify" its "design aspirations". The company, which also owns cinemas in Cornwall and Devon, said in January 2018 that its plans to rebuild the 1930s structure had not met "required design or financial criteria". In a new statement, it said it was now working on a fourth set of design proposals in a bid to find a "financially and architecturally viable" solution. A spokesman said: "At present, we have not consulted with local authorities as there is little point in wasting everybody's time presenting a scheme design that isn't viable. "New build cinemas are architecturally very complicated and the Lyme Regis venue being a listed building presents challenges to overcome, all of which add significantly to any build schedule." The company said it would work with the local authority and English Heritage on any design proposals. The building was extensively damaged by fire caused following an electrical fault on 22 March 2016. The auditorium was gutted, although the Art Deco frontage and the foyer were left largely intact.